One of my favorite shows at New York Fashion week is always Lela Rose. Her shows are always so ethereal – the models look angelic with their beautifully flowing dresses gliding down the catwalk. Her prints, embellishments and details are always unique and change each season, while the classic, feminine silhouettes generally stay the same. That’s what I love about Lela’s pieces: they just fit. All of her dresses keep in mind the natural curves of women’s bodies, so they are all amazingly flattering and look great on every body type. 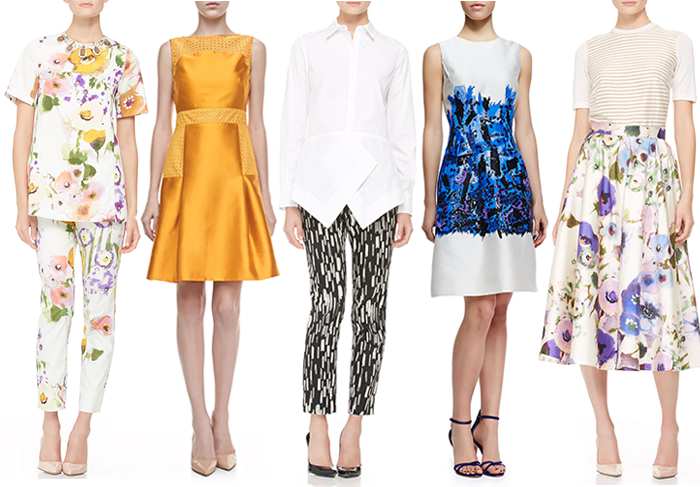 This spring, her floral prints and use of color are brilliant! I picked up this floral midi skirt for fashion week (stay tuned to see how I’ll style it) but this marigold sheath is next on my list. Isn’t it gorgeous? Don’t forget to follow me on Instagram for a look into my fashion week adventures while I’m in New York this and next week! Of course I am obsessed with that midi skirt. Loving the vibrant colors and prints. Have fun in NY and stay warm! Love that floral skirt! Can’t wait to see how you wear it! Hope you are having fun! One word STUNNING! That first look and last look are my favs. I am a huge Lela Rose fan! She is ridiculously talented, and I love all of her feminine pieces. Can’t wait for her new collection! That floral midi skirt is amazing. I’m in love with every single piece! All so ladylike and gorge! I want it allllllllllllllll especially the stripes with that amazing floral skirt…. I love the floral top and pant suit. SHe is fabulous! Always love Lela Rose. So feminine and dainty with a new flair every season. So springy and refreshing! I love that floral midi!